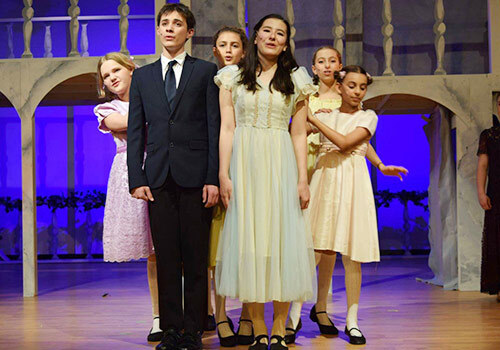 Middle School students can experience theatre by signing up for the Activity Period Acting classes, which explore acting techniques and audition skills; or by participating in the huge, annual Middle School Musical, in which students of all experience levels and abilities are invited to participate and learn from our theater professionals, with stunning results and rich memories. 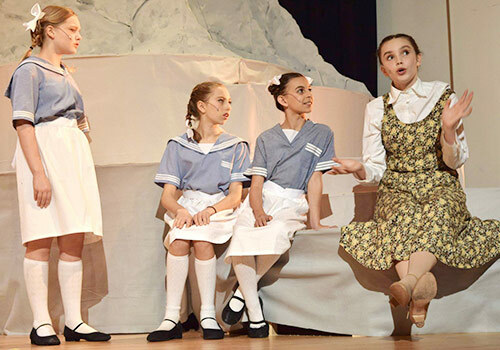 Congratulations to all of our Middle School thespians, choreographers, producers, tech crew, and musicians, on an incredible Sound of Music production! The San Domenico hills were indeed alive with the sound of music! Winner of nine Tony Awards when it debuted in 1964, Fiddler on the Roof has touched audiences worldwide with its humor, warmth and honesty. Set in the little village of Anatevka, the story centers on Tevye, a poor milkman, and his five daughters. With the help of a colorful and tight-knit Jewish community, Tevye tries to protect his daughters in the face of the changing times and the growing anti-Semitism of Czarist Russia. With timeless songs such as "Tradition", "Matchmaker, Matchmaker", "To Life", "Miracle of Miracles", "Sunrise, Sunset" and "If I Were a Rich Man", this show leaves audiences crying tears of laughter, joy and sadness. 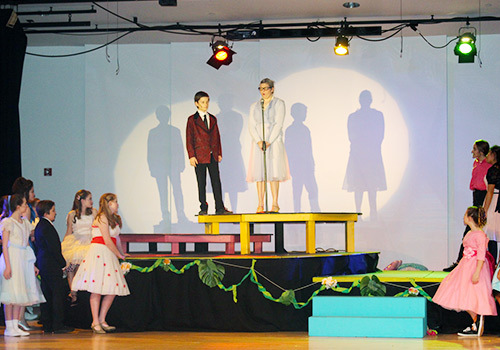 Congratulations to all of the students, parents, tech team, and musicians on the success of this year's Middle School musical, "Mary Poppins". Thank you to everyone who worked to make this magical production come to fruition, especially our fearless leaders, Doree Clark and Erica Smith. 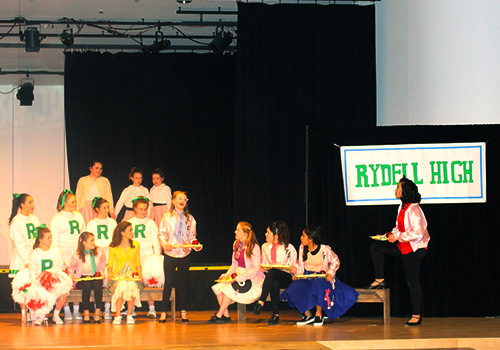 This year the Middle School play is Legally Blonde, a high energy contemporary musical! It conveys the messages of rising above disappointment, celebrating our differences, and achieving goals you never even dreamed of. All these wonderful messages wrapped up in a big pink bow, done through a host of characters who will sing and dance themselves into your heart! Over 40 middle schoolers are hard at work memorizing lines, songs, and dance routines and scenes for the this year's MS musical Legally Blonde. 2014 Musical - Into The Woods! Finally leaving New York and modern times, we venture back to the days of fairy tales. The Brothers Grimm "go Broadway" with five different stories that collide into one crazy tale about the lengths we go to get what we think we want. 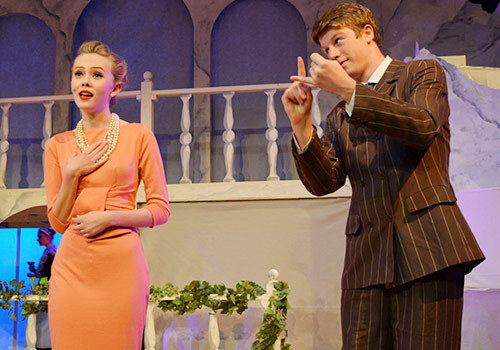 The musical starts with a baker and his wife who wish to have a child; Cinderella, who wishes to attend the ball; and Jack, who wishes his cow would give milk. When the baker and his wife learn that they cannot have a child because of a witch's curse, the two set off on a journey to break the curse and be free. With Little Red Riding Hood, Rapunzel, two princes and the big bad wolf joining in, everyone must enter the dark and terrible woods and wind up changed forever. Shakespeare's Romeo and Juliet is transported to modern-day New York City, as two young idealistic lovers find themselves caught between warring street gangs, the "American" Jets and the Puerto Rican Sharks. Their struggle to survive in a world of hate, violence and prejudice is one of the most innovative, heart-wrenching and relevant musical dramas of our time. 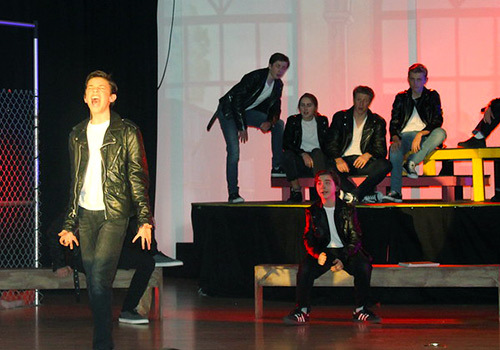 The 2012 musical, FAME, was high energy and contemporary, with many great roles for students to showcase our diverse performing arts talents—actors, singers, dancers, and musicians.